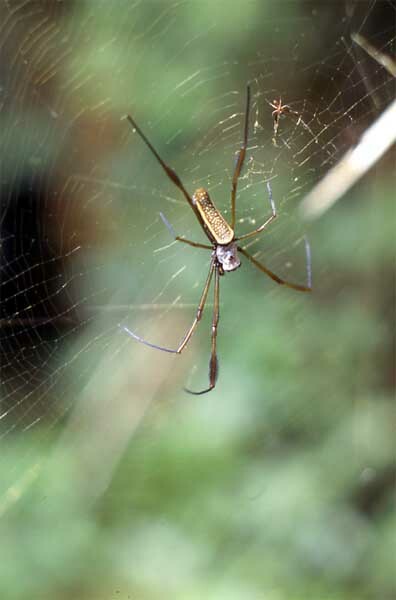 The golden orb weaver (Nephila sp., possibly N. clavipes) belongs to a widespread group of similar-looking spiders. These species build large webs comprised of golden strandshence the common name. The webs can catch large insects and even small vertebrates such as hummingbirds and frogs. The large body size (an inch or so long) is characteristic of the females only. The males are much smaller, as you can see in the photograph (upper right). The male courts a female with great caution. He plucks the strands at a specific tempo and must get it exactly right to avoid triggering the female's predatory instinct. If the male gets it wrong, he is promptly eaten by the female.